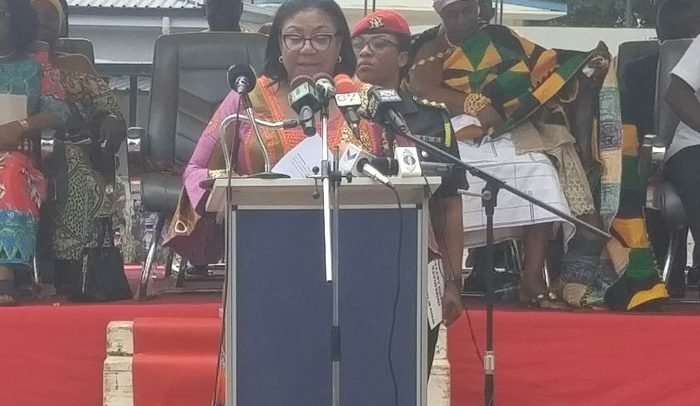 FIRST Lady Rebecca Akufo-Addo has called for more support for breastfeeding working mothers, especially at the workplace. According to her, making exclusive breastfeeding the norm requires the active support of employers and policymakers to change the operational policy environment. The event was under the theme: ‘Breastfeeding – Foundation of Life’. She said that experts have estimated that if the nation fails to act and scale up interventions that support an early and exclusive breastfeeding, the country would lose millions of dollars due to high mortality among women and children. “The good thing is we know what works. For some women, however, having this knowledge does not translate into the desire behavior change,” the first lady asserted. She added that making sure all new-born babies are given an early start breastfeeding requires action on the part of multiple players, including government, employers, healthcare givers, healthcare institutions, traditional leaders and communities. Dr. Patrick Aboagye, Director of Family Health at the Ghana Health Services (GHS), bemoaned the low practice of breastfeeding in the Ashanti Region, indicating that the practice was declining at an increasing rate. He stated that this accounted for the choice of Kumasi to launch the awareness campaign on breastfeeding as the foundation of life. According to him, a 2014 survey pointed out that only 52 percent of Ghanaian children enjoy breastfeeding due to inadequate information caused by poor support from spouses and unfriendly working environment for breastfeeding. This, he indicated, had made the GHS to institute measures, including sensitisation of lactating mothers and baby-friendly initiatives to address the challenges.